Note: Pandemonium is the second book in the Delirium trilogy, and the summary below may contain spoilers. Delirium was one of my favorite books from last year, and I was very excited to read Pandemonium. I'm not sure why it took me this long to read it, but on the bright side, the wait until Requiem is much shorter now! After the events of Delirium, Lena knows that her life now is going to be very different. However, she has no choice but to find a way to survive. Yet no matter how hard she tries, the emotional baggage she carries with her cannot go away. Once again she finds herself running, trying to put her thoughts behind her, until running becomes the only means of survival for her and the new family she has found. And when the running is over, Lena finds herself somewhere she never expected to be - part of the Resistance, charged with keeping the son of the leader of Deliria-Free America in her sight. Suddenly Lena's life seems linked to Julian's, and if they don't do something soon, they might not be alive much longer. From the very beginning, Pandemonium has a very different tone than Delirium. Where Delirium was a time of new love and hopefulness for Lena, Pandemonium shows the gritty side of fighting for survival in a repressed society. She is only now realizing how hard life can be, but despite everything, she is determined to survive. Once again Lauren Oliver's writing style was wonderful, alternating between clear and elegant and emotionally charged and gripping. Everything in this book - the emotions, the tension, and the fear - were so palpable. I was completely caught up in the story and living everything through Lena. There were moments of sadness, moments of high adrenaline, and even a few moments of tenderness, but there was certainly never a dull moment. I also loved the alternation of "Then" and "Now" narratives; it made everything more intense than having one continuous story. 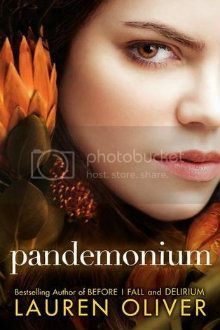 There are several new characters in Pandemonium, including Raven and Julian. I liked that Raven had a backstory and would have liked to have learned even more about the others of her group. Then there is Julian, the poster boy for the DFA that Lena is forced to rely on. Just like the others, Julian has his own emotional baggage, and some of his interactions with Lena were very touching. And finally, there is the ending...I need Requiem, and I need it now! Pandemonium is an excellent sequel and one that will leave you hungering for Requiem. I will be counting down the days! very true, pandemonium has a totally different feel than delirium. I really enjoyed it! I'd considered waiting to read this series until the whole lot had been published, but I have NO self-control! I liked how Delirium and Pandemonium had a different feel too - although I think overall I liked Pandemonium slightly more because of the dark, gritty parts!